Life is filled with decisions - some more important than others. Deciding what to wear, what to cook for dinner or whether to take a shower in the morning or evening are decisions everyone makes. But these decisions pale in comparison with more critical decisions like who to marry, whether to purchase a home, or whether to place a parent in a nursing home. Finding the right church ranks high as one of the most important decisions you will ever make. When making important decisions, prayer is essential. Prayer is one of the main forms of communication between a Believer and God. It’s important that we hear God’s voice and hear it clearly. Through prayer, we ask God for wisdom for those decisions we aren’t sure about. The Bible says, If you need wisdom, ask our generous God, and he will give it to you. He will not rebuke you for asking (James 1:5). God’s Word is also a vital source of information when making tough decisions. Meditating on key Bible verses and prayer are good combinations that open avenues for God’s wisdom to enter our minds. Counsel from those we respect - other Christians as well as those in authority over us - are other good sources. Just as spouses in a marriage relationship should make decisions together, so should believers partner with God in their decisions. The decision to follow Jesus Christ in a faith relationship is life’s most important decision, but deciding which church to be involved in is very important also. Finding the right church that teaches God’s Word as true and trustworthy as well as one that offers opportunities for you to grow spiritually and help others do the same is imperative. God knows you intimately because he created you, and he can help you find the right church that fits who you are. The search for a church should not be taken lightly. Selecting a church is one of the most important decisions you’ll make. Your spiritual life and the spiritual life of your family have an effect on every other area of your life. So when looking for a church, look for a group of people who are actively growing in their walk with God, and striving to be more like Christ. This will be evident in the worship music, the Pastor’s sermons and the atmosphere of community and love. “Is this a community of Christ-followers who are endeavoring to live their lives according to the Bible and seeking to grow in their Christian walk?” Attending a stagnant or complacent church increases the possibility of you falling into the same mindset. “Does the pastor have a heart for God, and a desire to serve the people of the church and see them grow and mature as Believers?” The pastor is not the sole leader in any given church, but he is the chief shepherd who must set the course and cast the vision for members to consider and hopefully follow. The Bible says; When people do not accept divine guidance, they run wild. But whoever obeys the law is joyful (Proverbs 29:18). “Is this a church I think I can grow in, where I can be challenged and encouraged by the pastor and others in the church, and where I can find a place to serve and minister to others?” As mentioned before, finding a church is not solely about what we can get from it. It’s also about what we can bring to it with the gifts God has given us. 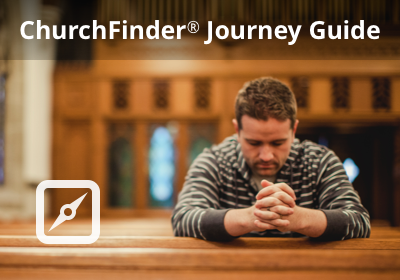 Because of church websites and websites like ChurchFinder.com, searching for a church and gathering information about it can be done without ever setting foot in a building. There are some churches you can even attend on-line without ever actually going. The Church Profiles on Church Finder detail the various ministries of the church, service opportunities, worship style and more. Some also include a Pastor Profile, a Church Photo Tour and a video page so you can find out more about church before you visit. But none of this can take the place of actually visiting a church and interacting with the people, even though it might narrow down your choices of which ones to actually visit. Interaction with people in a church building is one thing the Internet can’t provide. Depending on where you live, there may be numerous churches within driving distance. Since you may choose to visit many churches before making your decision, it’s wise to keep a journal where you can record details that may later be important when making your final decision. Since the Bible commands believers to be different from the world and to discover God’s will for their lives, finding the right church who does church Biblically correct is essential. The Bible says; Don’t copy the behavior and customs of this world, but let God transform you into a new person by changing the way you think. Then you will learn to know God’s will for you, which is good and pleasing and perfect (Romans 12:2). So take your church search very seriously. Take time to visit several churches. Think through each aspect of the decision, and most importantly, pray and ask God for wisdom and direction. But also, do not be so overwhelmed by the decision-or by wrong thinking of trying to find a “perfect” church, that you become a “church-hopper.” Church hoppers jump from church to church but never commit to any. Or worse, you don’t make a decision at all and believe the lie you can “do it yourself” when it comes to your spiritual growth and walk with God. You don’t have to go through the journey of life on your own. God has a church family for you! If you have recently moved to a new city, have been out of church for some time, or have never really been to a church, take some time and prayerfully plan your church search. After all, if you find the perfect church for you it could change your life in a greater way than you ever imagined! God, thank you for having a plan for my future. I ask you to guide me as I look for a church family. Please lead me to the right church for me, and give me wisdom as I visit churches and look for a place to call my spiritual home. I want to be an active part of Your church. Help me to find a place where I can use the gifts you have given me to minister to others. In Jesus’ name I pray, amen.